It's the mobile part, but it's better than integrated and enough for most gaming. Lenovo’s Yoga 720 belongs to a new breed of mainstream laptops that pay respect to PC gaming, e-sports, and Twitch streaming. Users who may not want an official gaming laptop (such as Lenovo’s own Legion) may still want some extra GPU power, and the Yoga 720 can bring it with optional, discrete Nvidia GTX1050 graphics—the mobile part, not the desktop part. Granted, you won’t find it at the base model’s $1,099 price, but that would be too much to ask. Announced Monday at Mobile World Congress and shipping in April, the Yoga 720 remains true to its flagship roots by offering a strong selection of features for its size. Your CPU choices go up to Intel 7th-generation Kaby Lake, and you can get up to 16GB of DDR4 RAM. Storage options encompass traditional HDDs up to 1TB or SSDs up to 512GB. 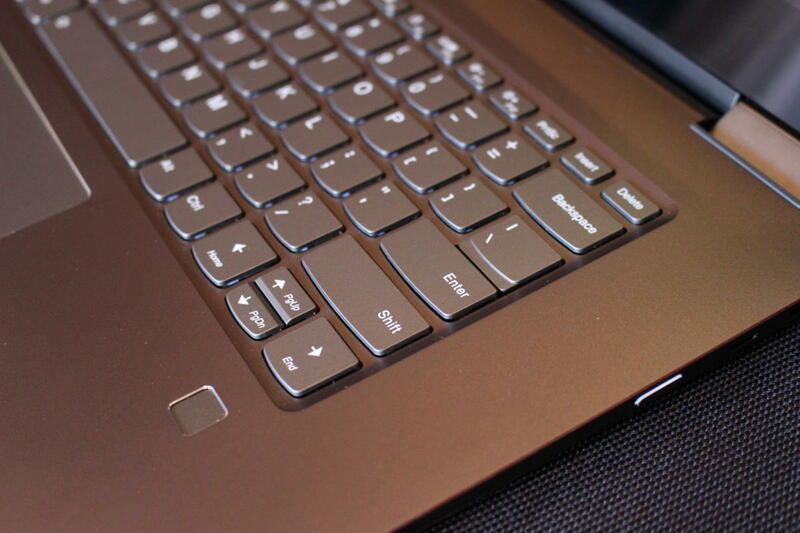 The Lenovo Yoga 720 has a full-size keyboard as well as a fingerprint reader for Windows 10 authentication. The 15.6-inch IPS display has a resolution of up to 4K Ultra HD (3840x2160). While that incredible crispness is tempting, you may not want to run it on that resolution all the time, as it uses more battery life. Lenovo estimates the Yoga 720 will last up to 8 hours at UHD, but up to 9 hours if you drop to FHD (1920x1080). Connectivity stays on trend with USB 3.1 Type C and Thunderbolt (using the Intel controller). You also get active pen support and a fingerprint reader for easy Windows 10 authentication. In an early briefing, Lenovo told us that product managers consciously chose that mode of authentication because users were familiar with it through smartphone use. It’s also cheaper and easier to integrate a fingerprint reader than to shoehorn Intel’s RealSense camera (for facial recognition) into a slim-bezeled unit. 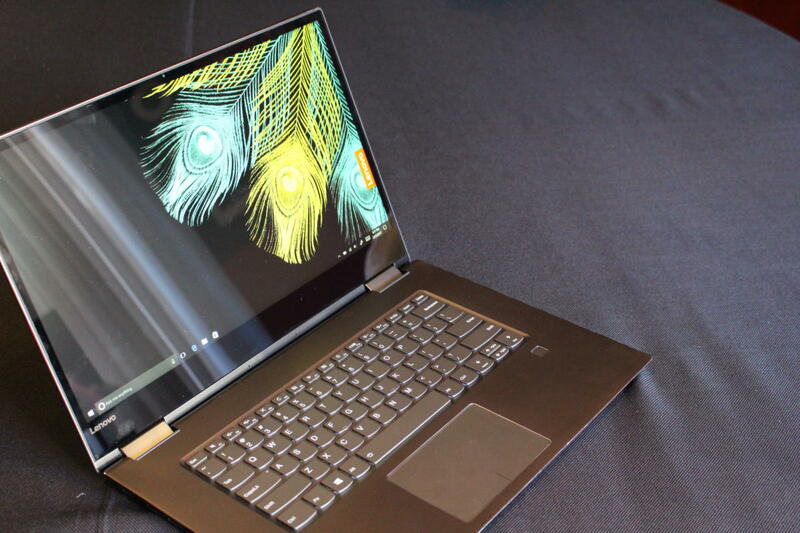 The Lenovo Yoga 720 offers a USB-C port with Thunderbolt as well as the older USB-A for legacy devices. Of course, the Yoga 720 also offers the fun of using the laptop in clamshell, tent, or view modes simply by rotating its two halves around its 360-degree hinge. I wouldn’t recommend using this 4.4-pound machine as a tablet unless you could rest it on a table or your lap, but it’s a very nice option to have, especially in cramped quarters such as a commuter train or airplane. As the flagship Yoga product, the 720 promises great flexibliity, and now, with the discrete graphics option, great power.